It is a dazzling interpretation that has been arranged by animal, making it easy for children to follow. It is aimed at children age 5 to 8 years old. 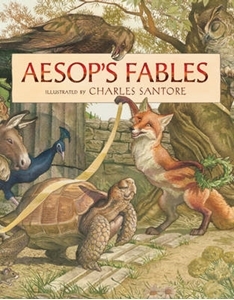 Aesop's wise and witty fables are among the most popular stories ever written and Charles Santore's richly illustrated version is one of the most gorgeous editions ever published. Unavailable for a number of years, this dazzling interpretation features lavish art that provides a fresh perspective on Aesop's beloved characters. Santore has arranged these timeless tales by animal, making it easy to follow each creature from one situation to the next and gain a better understanding of how its actions parody human behaviour.